I knew it was time for new skates. I loved my old Bauer Supreme 3000 goalie skates, but years of sharpenings had left very little steel, and on those skates, replacing the steel requires replacing the cowlings. That’s an expensive operation, so I decided to pull the trigger on some new goalie skates instead. I’d heard about problems with the pumps on Reebok skates, so I dropped them from consideration. The Grafs looked good on paper, but the Goaler Pro 750 was an older skate, and I hadn’t heard much about Graf’s new skate, the Ultra G50. But those are just excuses. Really, I wanted to stick with what I knew worked: Bauer. 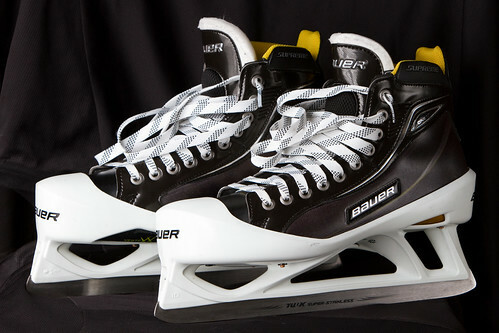 Bauer also makes a One80 goalie skate (and for that matter, a One60 goalie skate), but I liked the idea of a 3mm blade, so that meant going with the One100 skates. There were two different color options: regular (black and white) or limited edition (all white). The all-white One100s looked pretty sharp, but I didn’t think they would age well. I’ve seen many instances of whites yellowing at different rates, and I was worried about that happening with my skates. Off-white mismatched skates aren’t nearly as cool as all-white skates. I went with the traditional color scheme. Again, there were choices for sizing. 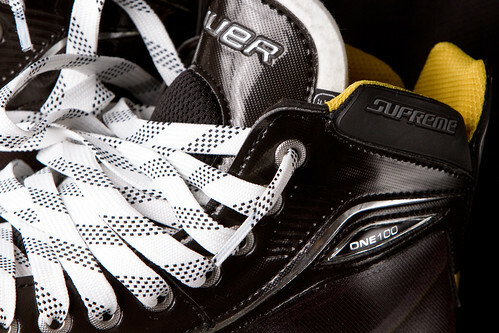 For my old Bauer 3000s, I wore a skate size 10.5D, which is roughly equivalent to a shoe size 12D. That’s a bit odd, because my actual shoe size is 11.5 (with an unknown width). I remember it taking quite a while for my old skates to break in and fit correctly, so I decided to reevaluate my sizing for my new skates. In particular, I suspected that what I actually needed was a wider skate, not a longer skate. I tried on a 10D, and it was far too narrow. Then I tried on a 10EE — which gives about a quarter-inch of extra width — and my feet were in foot heaven. Skate size 10EE equates to shoe size 11.5, so that was consistent, too. The skates were loud on the ice. When I turned sharply or hockey-stopped, the skates barked like seals. Pretty crazy! The blades needed to be profiled. My right skate seemed to have a consistent radius of curvature of about 30 feet, but my left skate had a flat spot. Want to know how to convert your old 4mm-blade-width hollow to you new 3mm-blade-width hollow? Simply multiply it by 0.75. For a 5/8″ hollow, that gives you a new hollow of 15/32″, which is roughly equivalent to either 7/16″ or 1/2″ (because your shop might not do hollows in 1/32″ steps).